The story of Medusa and her snake hair was one of the first ancient legends that I had heard about as a child. She could turn you to stone, just by looking at her! It was the curse of the Gorgons, a trio of sisters all with the same wicked appearance and power. The Gorgon deals with the creature Megaera, one of Medusa’s siblings, who is the final living of the monsters. Now, I’m not one of the most vivid Hammer fans - which this film is - but I can definitely appreciate the work that they have shoveled out. Though I have barely scratched the surface of these treats, I’m assured that The Gorgon is one of the strongest in these long line of features. It’s creepy, cinematographic genius, and dare I say, fun. It’s a shame that its real fault is in the gorgon herself. But, hokey snakes aside, I think you’ll find it still has a lasting effect with its retelling of a classic tale, set in the early 1900s. The village of Vandorf is stubborn in its quest to cover up a series of unexplainable murders that have taken place in the residence within the past five years. The victims always turn up stone cold dead; that is, literally turned to stone. When Bruno and his wife to be turn up dead as well, Bruno’s father Professor Jules Heitz (Michael Goodliffe) goes to the town to investigate his son’s sudden fault. When he comes face to face with the danger, he is turned to stone also, but not without a few letters addressed to his other son first. Now, Paul Heitz (Richard Pasco) has come to the village after seizing his father’s notes, and firmly believes that something is not right. Dr. Namaroff (Peter Cushing) and his patient Carla Hoffman (Barbara Shelley) sneak into the son’s house to gather the information given to Paul, only to find out their fears are practically confirmed. The Greek myth of Megaera is here in Vandorf. Paul’s friend Karl Meister (Christopher Lee) eventually travels to the village after Paul has a close encounter with the beast, and barraging through the restraints of local law enforcers, closes in on the truth. However, will a new love between Paul and Carla muddle things up, or will the jealous Namaroff be the one to end Heitz’s journey? With Hammer’s trademark visual style, the German village of Vandorf is enhanced with beautifully set pieces of stage, background, and lighting (more so the former). Moody dark forests, house ruins and interior designs make these selections of film particularly easy to highlight for their intense energy, even when plot is at a standstill. The Gorgon starts off a bit cheesy, with Sascha and her lover Bruno having a soap opera moment involving unforseen pregnancy and horribly fake tears. Charming, but this quickly breaks tone as the first two murders of the film are produced, both off screen but one very effective for its first true look at terror in the movie: The hanging body of a bloody faced Bruno Heitz. Being cheap won’t stop it. As clearly shown, Gorgon alternates from a mystery drama to spookily designed creepy tale that will haunt a section of your mind in subtle flow. The entire first half is good, but wait until the characters start to conclude the idea of the gorgon spirit taking on human form. It is here where you get glued to the screen, following the story delicately, and never letting go. Horror films work in mysterious ways. The twist is easy to guess, which appears to be the intent due to the obvious hints throughout, but the revelation is still moving. Creditable acting from all around is the strong spot, changing a simple (but don’t forget haunting) plot into a gothic semi-classic. Fisher’s film is not without its faults, as the snakes upon the Gorgon’s head are...a bit stationary. A couple scenes (one in particular involving the attack of Carla) are too quick or not explained well as to why they occurred. But, with sequences like the elder Mr. Heitz roaming an abandoned cobwebbed lair fit for a dreaming artist - or gorgon - these are so dismissible, it’s not even funny. A serious enchantment of Hammer horror. The slow, presumably painful deaths of doomed ‘stoners’ are little grey make-up jobs between shots, and with the exception of rubber snakes, all is standard of the 1964 times. The music adds so much to Gorgon that it teeters on the level of scary, especially with the dead soul singing sounds that drift in Jules Heitz’s wandering ruins scene. Oh. There I go again mentioning that part. Why don’t I just say that’s the best scene and be done with it? However, it has very pumped competition. A dark finale, glowing with thrills, and the first confrontation with Paul and the evil myth. A fine addition to characters, other than the always powerful Lee and Cushing (here, Cushing is a tad better approach) is the bat crazy lady Martha, another patient of the doctor who looks very somewhat like the gorgon. Could she actually be the hiding creature? Stay tuned. The answer is near the end...of the film, that is. But like I said, if you’ve seen a movie before, you’ll guess it no doubt long before. Bodies made of stone in coffins and on tables! A town conspiracy against the truth! A fight between two leads; one armed with a sword, the other a large metal candlestick (don’t worry for Cushing, as it seems rubbery at times). The Gorgon makes you crave to see the monster, but also dread it, teasing you but giving enough screen time to satisfy. The whole thing is pleasurable, and I hold it in high praise as 60s gothic horror. 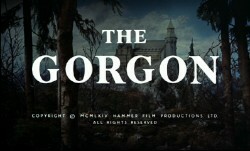 Universal released a collection of four Hammer films in late 2008, which is where I first became interested in seeing The Gorgon. 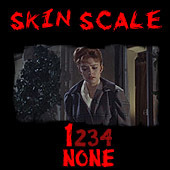 A few months earlier, the public had an online poll for what the cover of the DVD could look like. Thankfully, my pick was chosen. Hooray! I suppose I felt obligated to buy it after participating in the survey, but after seeing pictures of Megaera, I was probably going to get it anyways. With its own trailer and other films like Scream of Fear, The Curse of the Mummy’s Tomb, and The Two Faces of Dr. Jekyll, the polished looking Gorgon in this set is a must have for fans of these flicks. Chilling and clear, visually compelling with a sensational eerie sound, you must own its hideous power. Admire through a reflection, but don’t look into its eyes. Oh Hell, what’s the worst that could happen? Stare directly if you must. Buy it!